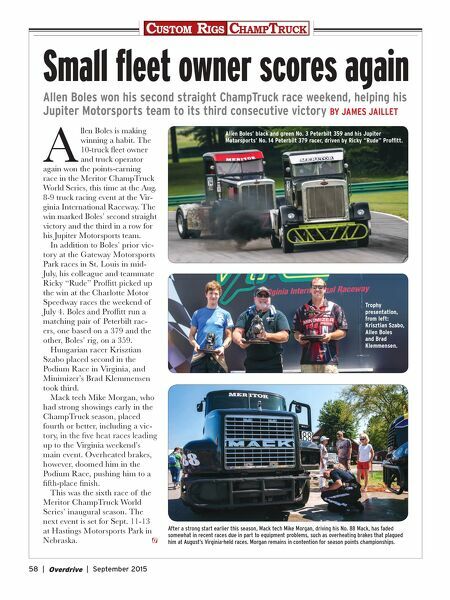 Custom Rigs ChamptRuCk 58 | Overdrive | September 2015 Allen Boles won his second straight ChampTruck race weekend, helping his Jupiter Motorsports team to its third consecutive victory BY JAMES JAILLET A llen Boles is making winning a habit. The 10-truck fleet owner and truck operator again won the points-earning race in the Meritor ChampTruck World Series, this time at the Aug. 8-9 truck racing event at the Vir- ginia International Raceway. The win marked Boles' second straight victory and the third in a row for his Jupiter Motorsports team. In addition to Boles' prior vic- tory at the Gateway Motorsports Park races in St. Louis in mid- July, his colleague and teammate Ricky "Rude" Proffitt picked up the win at the Charlotte Motor Speedway races the weekend of July 4. Boles and Proffitt run a matching pair of Peterbilt rac- ers, one based on a 379 and the other, Boles' rig, on a 359. Hungarian racer Krisztian Szabo placed second in the Podium Race in Virginia, and Minimizer's Brad Klemmensen took third. Mack tech Mike Morgan, who had strong showings early in the ChampTruck season, placed fourth or better, including a vic- tory, in the five heat races leading up to the Virginia weekend's main event. Overheated brakes, however, doomed him in the Podium Race, pushing him to a fifth-place finish. This was the sixth race of the Meritor ChampTruck World Series' inaugural season. The next event is set for Sept. 11-13 at Hastings Motorsports Park in Nebraska. Small fleet owner scores again After a strong start earlier this season, Mack tech Mike Morgan, driving his No. 88 Mack, has faded somewhat in recent races due in part to equipment problems, such as overheating brakes that plagued him at August's Virginia-held races. Morgan remains in contention for season points championships. Allen Boles' black and green No. 3 Peterbilt 359 and his Jupiter Motorsports' No. 14 Peterbilt 379 racer, driven by Ricky "Rude" Proffitt. Trophy presentation, from left: Krisztian Szabo, Allen Boles and Brad Klemmensen. Pulse: Suicides leave truckers on defense. Rhode Island governor wants truckers to pay. ‘Operation Truck Stop’ targets off-toll-road rigs. Agencies vow to address truck parking shortage. OOIDA petitions against speed limiter rule. Coalition opposes hair sample drug testing. Overdrive’s 2015 Pride & Polish national champs named at GATS. Small fleet owner wins another ChampTruck World Series race. 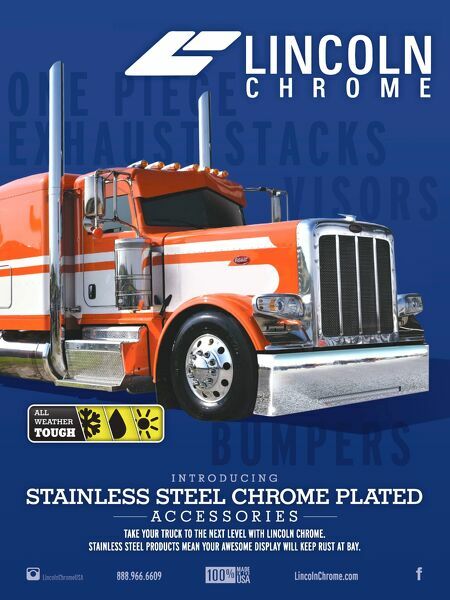 Overdrive readers can pick favorite show truck. Reader Rigs: 2000 W900L a Renegade; ’15 T800 a new rig; ’03 Pete a homewrecker; ’09 W900 stylin’. Among drivers, Trump tops poll for president.